In experiment 5, participants consisted of drivers who traveled on 1st Avenue N and 61st Street and pedestrians who crossed the street. This site is a one-way avenue where the crosswalk traverses three lanes and has a posted speed limit of 35 mi/h and an ADT of 12,245. This site does not provide a median for crossing pedestrians. The treatment in this experiment was the standard RRFB described in experiment 4. A standard pedestrian warning sign with two LED flashers with the same light positioning, timing, and sequence was used. Additional RRFB advance warning units were also placed on each side of the roadway 2 1/2 times the distance of the dilemma zone for this location. These advance warning devices did not have any call buttons and were attached to a PEDESTRIAN CROSSWALK AHEAD sign. The advance warning devices were activated when the call button at the crosswalk was depressed. The RRFB unit at the crosswalk would not activate when the advance warning devices were turned on until 2.5 s had elapsed. This experiment was conducted at 1st Avenue N and 61st Street to compare the efficacy of RRFB units with the addition of an advance warning LED unit. It used an alternating treatment design similar to the one used in experiment 4. During the baseline condition, driver yielding compliance and the distance of yielding were collected for 6 sessions, each consisting of 20 crossings. 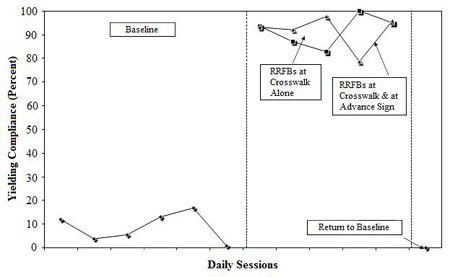 Following the baseline condition, each treatment condition was then evaluated for 20 crossings per session. Each session was alternated with the other in rapid succession. The RRFB units alone were evaluated first for 20 crossings. Following this phase, the advance warning devices were turned on and evaluated in addition to the RRFB units at the crosswalk for 20 crossings. This method was repeated until each of the treatment conditions had been evaluated five times. Following data collection of the treatment conditions, a return to the baseline was observed for 20 crossings. A z-test for proportions was used to test whether the RRFB alone or the RRFB plus advance warning sign produced more yielding. The results were not significant at the 0.01 level (z = 0.26 with 39.7 percent confidence level). The average yielding compliance at the site during the initial baseline recording was 8.6 percent. The yielding compliance during the initial baseline ranged from 0.8 to 17 percent. The RRFB unit alone produced yielding averages of 95, 85, 83, 100, and 95 percent per session. The average yielding compliance during the RRFB at the crosswalk alone was 92 percent. The RRFB plus advance warning device had yielding averages of 93, 92, 98, 79, and 96 percent, respectively. The average yielding compliance during the RRFB plus advance warning condition was 92 percent (see figure 9). A return to baseline conditions for 20 consecutive crossings produced a yielding compliance of zero percent. The number of vehicles observed as not yielding during the return to baseline conditions was 344. Figure 9. Graph. Yielding compliance during the baseline and the RRFBs at the crosswalk alone versus the RRFB at the crosswalk plus the RRFB at the advance sign. The absence of LED devices at this site was associated with a large proportion of driver yielding at 30–50-ft, with a yielding compliance of 37 percent. The second and third highest yielding distances during the baseline were the 20–30-ft and 10–20-ft intervals, with yielding compliances of 30 and 13 percent. During the RRFB at crosswalk alone condition, the largest proportion of drivers (39 percent) yielding more than 100 ft in advance of the crosswalk. The second and third highest percentages of yielding occurred at the 30–50-ft and 50–70-ft intervals, with 18 and 16 percent yielding compliance. The RRFB on the crosswalk and advance warning sign condition produced the highest proportion of drivers (49 percent) yielding over 100 ft from the crosswalk. Drivers yielding farther in advance of the crosswalk can be expected to improve the safety of pedestrians (see figure 10). Figure 10. Graph. 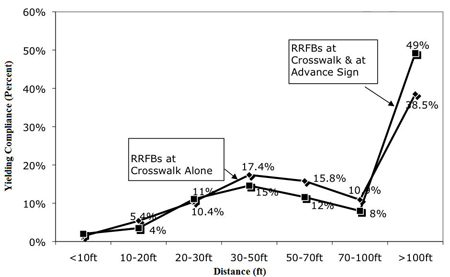 Average yielding percentage during the RRFBs at the crosswalk alone and the RRFBs at the crosswalk and on the advance sign.